Notices of 2015 rates for Medicare Advantage plans started landing in mailboxes last week, and at least one local plan is seeing premiums more than triple. I heard from David Darwin of Charlotte and Gary Ludwick of Huntersville, both of whom were told that their HMO premium from Blue Cross and Blue Shield of North Carolina is going from just under $19 a month to $64.40, with their out-of-pocket limit rising from $3,400 to $4,500. Both wanted to know what's going on. That runs counter to the trends announced by the federal Centers for Medicare & Medicaid Services. The agency says 2015 premiums are rising an average of $2.94 next year, to $33.90 a month, and estimates the actual hike will be more like $1.30 a month on average as some choose lower-cost plans. "The vast majority of (Medicare Advantage) enrollees will face little or no premium increase for the next year with 61 percent of beneficiaries not seeing any premium increase at all," the release says. Ludwick and Darwin, not surprisingly, are wondering if their notice foretells bad news for more people in this area. "Maybe you can get some answers as to what caused such outrageous price hikes across the board," Ludwick emailed, "and I'm also curious if the costs for Obamacare have any bearing on this." "I just think people need to understand what they're about to be hit with," said Darwin, a textile retiree who also blames the spike on the Affordable Care Act. Some background: Medicare Advantage is an alternative to traditional Medicare, which provides health coverage for the elderly and disabled. About 30 percent of the total Medicare population chooses this approach, which involves buying a policy through a private insurance company. This is separate from the ACA marketplace that has gotten so much attention in the past year, but it works in a similar way: Customers have a choice of various plans based on where they live. In 2014, Mecklenburg residents had 22 plans to choose from. 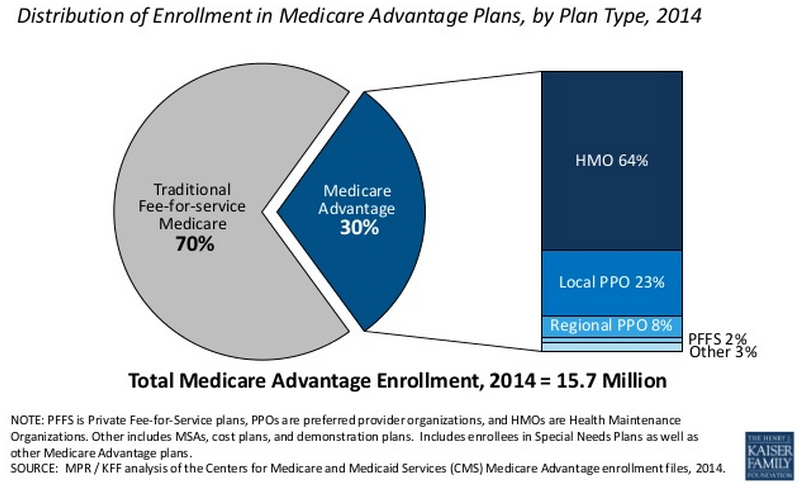 Medicare Advantage also costs the government more than traditional Medicare. The ACA cut Medicare Advantage payments, but instead of the expected decline in participation, record numbers are choosing that route, according to a Kaiser Family Foundation report. "When Congress debated the payment reductions in 2010, forecasters and analysts also projected that reductions would drive insurers to raise premiums, cut extra benefits and even pull out of the Medicare Advantage market as they did after the Balanced Budget Act of 1997. Thus far, however, the response by insurers to the ACA cuts has been more muted," says the report by Tricia Neuman and Gretchen Jacobson. So what's going on with Darwin's and Ludwick's policy? I asked Neuman, the foundation's Medicare expert, what to make of the big bump in this local plan. The 2015 national data just came out Thursday, so she hadn't had time to analyze it in detail when we spoke. There are always wide variations among plans, she noted, and the averages indicate these folks are seeing a hike that's an outlier on the high side. Market conditions seem more likely to be the source than the ACA, she said. "If it was really attributable to the law you'd be seeing it more across the board," Neuman said. "It would be more the norm than the exception." Starting Oct. 15, Medicare Advantage customers will have a chance to shop around and see if they can get a better plan for less money. It will be interesting to see what the Mecklenburg market offers. This article was a total waste of space...it didn't really explain anything definitively. I totally agree.... the status of true investigative reporting is at a all time low. My wife also got those kind of increases. And some of her medications are tripling in price. BCBS: WHY did you raise the premiums so much? Federal Centers of Medicare and Medicaid Services: Why is the experience so different in NC from what you have announced? Ms Helms, if you need help finding the phone numbers I would be happy to get them for you. Actually i took 45 seconds and looked them both up. Here you go. Chuck, I agree -- this would be a poor example of investigative reporting. That's why you won't see it on the Observer's front page. A lot of potential stories come my way every day, and I see blogging as a middle path between "spike it" and "do a major story." It lets me put something out for early discussion that can help determine whether this is something that affects a handful of people or a significant trend for North Carolina. I did contact BCBS and got a vague response. If this turns into a real story, I will definitely keep pushing. I am one who received the exact same increases from BCBS NC. I will be shopping alternative plans. Why do they make everything so difficult? I received the same notice, and in addition to the 300+% increase, the Silver Sneakers benefit is dropped. This is an attempt by BCBS to game the Obamacare system and I expect that other insurance companies to follow suit. Let me help a little as I am a agent in this industry. So the payments from the Govt to BCBSNC have been reduced. On average $750/month goes to BCBS each month for a MA beneficiary by the way. The MA pool with BCBS is not running good with the population getting older and sicker. Lots of folks start with Med Supp plans which are superior coverage but do cost more. They do not have deductibles and copays. As clients get older and have less income, guess what? The MA plans suddenly are very attractive. Also as they get older many convert to MA plans because they have less retirement income or savings. Be thankful because the under 65 market is worse right now cost wise, unless you are subsidy eligible. Both segments will have pools that will run worse and worse throughout the years. As the private carrier plans cost higher and higher, there will be a PUBLIC option years down the road. Trust me on this! Its inevitable. They already have millions of signed up with healthcare.gov and it will continue to snowball. So far the only thing the ACA has accomplished is allowing people to purchase health insurance on and off the exchange. However the elephant in the room is sure the cost trend has slowed from years past, but it will take the next 5 years to see the new cost structure hit the doctors/hospitals. That will vastly change the services provided by Novant and CHC hospitals/providers. When their compensation is tied to efficiency of their patient care its a totally new model. Gone are the days of ordering 5 tests and get paid per a test. Going forward its all analyzing big data to help provide more efficient care. So prices across the board will continue to rise for everyone. Welcome to the new healthcare in the US. Your blog entry should definitely be expanded to a "real story". I too have been notified that my BCBSNC Medicare Blue premium will increase from $18+ to $64+. Add to the list of reduced benefits that PCP office visit copay doubles from $10 to $20, and specialist copay goes from $35 to $40. I will now look into switching to a traditional Medicare plan. However, the premiums don't change until July and new pricing will not be available until May. See the handwriting on the wall?